This method closes the connection. Driver's implementation of the close method is optional. If it is implemented, BIRT will call this method when the associated data source is closed. queryTimeOut Query Timeout (in seconds) Number of seconds allowed for executing a Web Services query. A timeout error will be reported if the query does not return its complete result within this time limit. Default value is 300. The Web Services Data Set supports input parameters. Input parameters are defined by the report designer, and may be edited in either the Data Set Editor’s Parameters tab, or in the query editor UI of the data set designer (see UI mockup in the following sections). NOTE: The &? delimiters are chosen because they never appear in sequence in a well-formed XML document (except in CDATA sections). Use of these delimiters minimizes the possibility that they be erroneously recognized in a normal SOAP message. The “&?... ?&” markers must appear in pairs, and the opening markers must occur in the same text line as the closing markers. Otherwise they are not recognized as a parameter reference, and will be treated as part of the SOAP request. 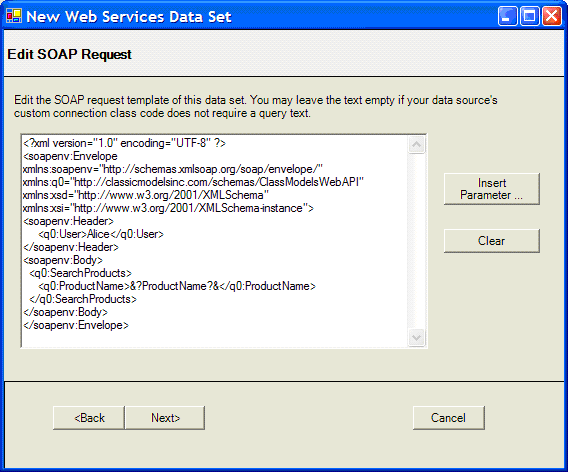 The following query text for a Web Services Data Set defines the template for a SOAP SearchProducts request. It refers to a data set input parameters, ProductName, which must be defined on the data set. Example: Date/time parameter value of “4:05 PM, January 13, 2006” (US English format), is converted to string “2006-01-13T16:05:00”. If non-conforming conversion of values is needed, the user should define the data set parameter as String type, and perform the custom conversion in the data set parameter binding expression. 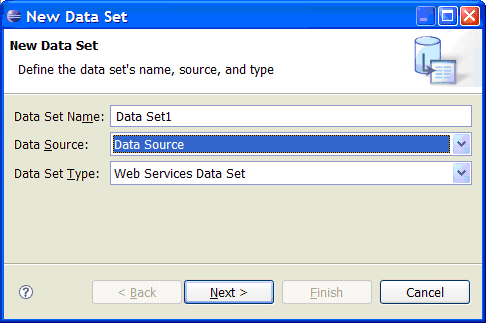 When a Web Services Data Source is selected in the New Data Set Dialog, a single Data Set Type, “Web Services Data Set”, is available in the Data Set Type dropdown list. 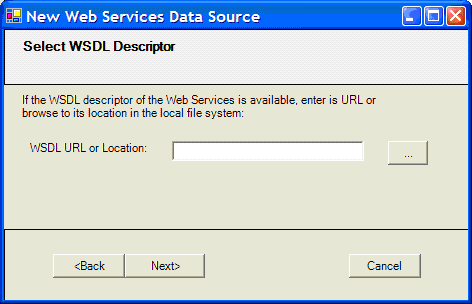 This dialog is displayed only if the data source has specified a valid WSDL descriptor. If no WSDL is available for the data source, the wizard will skip this dialog and will bring the user to the dialog in Section Edit Soap Request , where he can enter the query text without the help of WSDL. The dialog will displays, in a tree structure, all the SOAP bindings and services defined in the WSDL. The user should select a SOAP operation (from a tree leaf node) and continue to the next dialog to create a SOAP request template based on the selected operation’s schema. If the “Skip>” button is selected, the WSDL document is not used to create the SOAP request template, and the next wizard dialog is skipped. The user will be brought to the dialog in Section Edit Soap Request. NOTE: This dialog is modeled after part of the Web Services Explorer View of the Eclipse Web Tools project. This dialog is displayed only if the user has selected a WSDL operation in the dialog in Section Selecting a WSDL Service, and selects “Next>”. 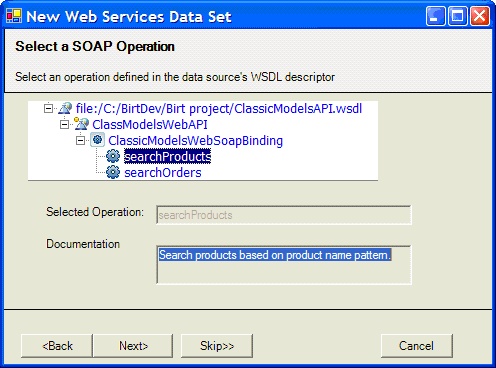 The dialog displays a form which helps the user to create a SOAP request template based on the WSDL definition of the selected operation. NOTE: This dialog is modeled after part of the Web Services Explorer View of the Eclipse Web Tools project. The Add and Remove hyperlinks, the checkboxes and the textboxes shall behave the same as they do in that view. The Insert Parameter hyperlink, when clicked, will cause a Parameter Selection Dialog to be shown. The user can select an existing data set parameter, or create a new one, to be associated with the SOAP request parameter. The wizard will then insert the parameter reference marker (&?param_name?&) into the textbox for that request parameter. In dialogs in Section Generating SOAP Request Template From WSDL and the dialog in Section Edit SOAP Request, choosing "Insert Parameter" will cause the wizard to show the following popup dialog. The user can select an existing data set parameter from this dialog, or create a new one. He may also edit or remove existing data set parameter. When the OK button is clicked, the selected data set parameter from the list is inserted into the SOAP request template. 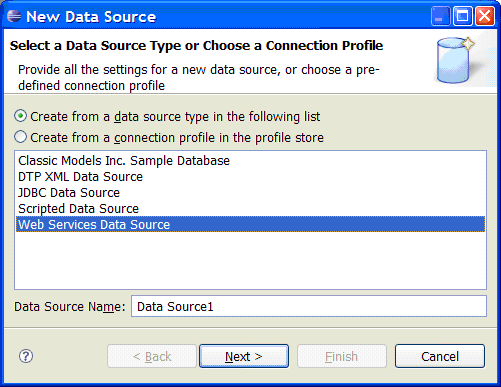 This dialog allows the user to view and edit the SOAP request template (the query text of the data set). This is the first dialog of the wizard if no WSDL descriptor is available for the data source. 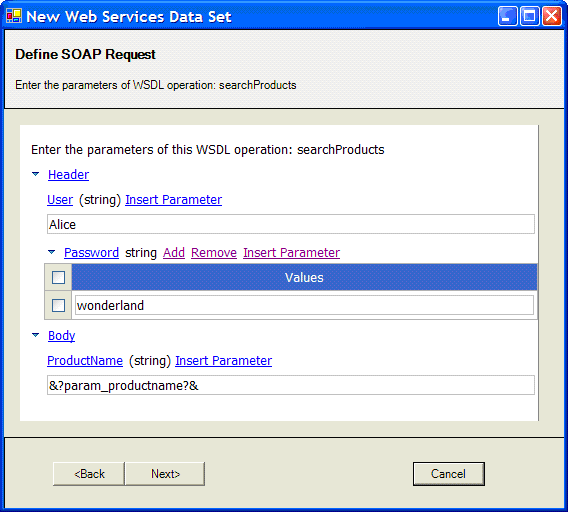 If the WSDL descriptor is available and the user has completed dialog in Section Generating SOAP Request Template From WSDL to define the SOAP request, this dialog shows the generated SOAP request. If no SOAP request template has been defined when this dialog is initially shown, the dialog will create an SOAP request that includes empty header and body sections. The "Insert Parameter …" button will cause the Parameter Selection Dialog to be shown. The "Clear" button clears the entire text area. Note that not all Web Services data sets require a query text. In the case that the data source uses custom Java driver class, the driver may not use the query text defined in the data set for its query. Therefore this dialog permits an empty query text to be defined. 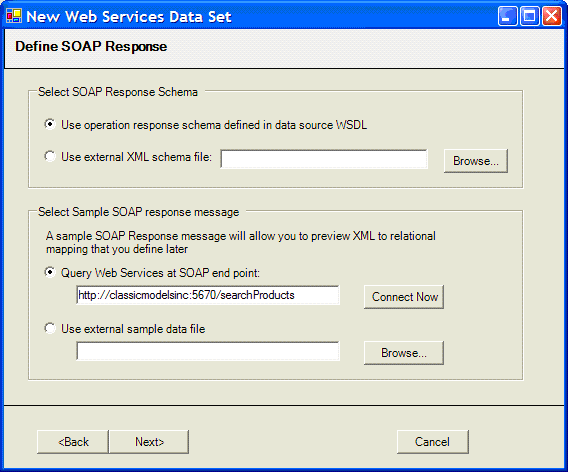 This dialog defines the SOAP response schema and selects a sample SOAP response message. This is the prerequisite for mapping the SOAP response to a tabular result set. If the WSDL descriptor for the data source is available, the user may choose to use the response schema defined in the WSDL. This is the default option. If WSDL is not available, this checkbox is disabled. The user may select an external XML Schema (XSD) file for the response. The user may choose to issues a Web Services query to obtain a response message. 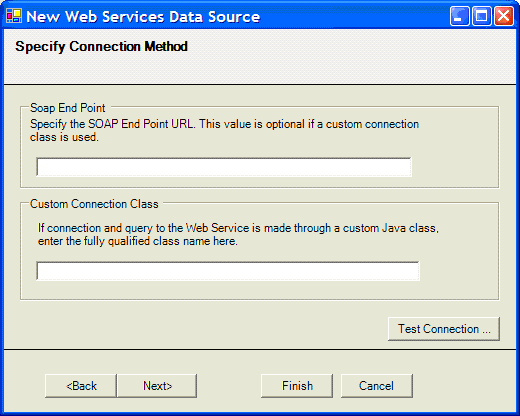 If this option is selected, he may enter a SOAP endpoint to connect to (the data source’s SOAP end point property is used by default), and then select “Connect Now” to issue the SOAP request. The user may also choose to use an external file to supply a sample response message. Either a SOAP response schema, or a SOAP response message, or both, must be provided before the wizard can proceed to the next step. The subsequent dialogs duplicate the XML to relational mapping dialogs of the DTP-XML ODA data source. This page was last modified 13:51, 29 March 2007 by Scott Rosenbaum. Based on work by Gary Xue, Linda Chan and Lin Zhu.